Are you on the highway looking for that perfect fall photo op? 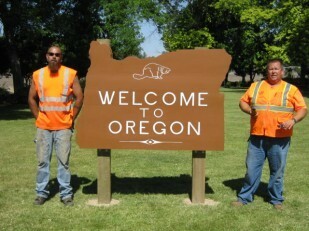 Oregon Travel Experience would like to post your photo in our “Welcome to Oregon” blog post for December. Stop at the I-84 rest area outside of Ontario, Oregon (MP 377, west) and snap a photo of yourself or friends and family by the side of the “Welcome to Oregon” sign. Write a little blurb about where you’re from and where you’re headed. Make sure you let us know your name. Then email us the photo by November 30, 2011. That’s all there is to it. Minors under the age of 18 should have parents sign an OTE photo release form. Forms may be submitted via email with your digital image. Photos submitted will be credited to the photographer but become the property of the State of Oregon and OTE, and may be used for non-revenue producing campaigns. Featured photos may be selected to appear on OTE Facebook accounts. Featured photos may appear in OTE print or online publications. Only one digital image per person (or family) will be accepted. No animals are allowed in the Welcome to Oregon sign area. Sorry! We know that furry friends can be considered members of the family but state rules permit animals in designated pet exercise areas only at highway rest areas. Please be tasteful. If you think it might not be appropriate for a state agency website, it most likely isn’t.